It has been more than a month since a group of Sudburians took to the streets to voice their displeasure with a Sudbury home improvement company. Protestors gathered March 7 at the corner of Paris and Brady Street to speak out against EcoLife Home Improvements and its owner Dave Murray, while calling on the Greater Sudbury Police Service to look into fraud charges against Murray. In the wake of the protest, Murray issued a written statement, pointing to the Ford government's cancellation of the GreenOn program as the reason that number of jobs he had taken on were not yet completed. Last week, the City of Greater Sudbury revoked the business license of EcoLife Home Improvements after conducting thorough investigation into a number complaints made against the contractor. Aside from his written statement, sent via email to Sudbury.com on the day of the protest, Murray had remained mostly silent, until recently when he sat down for an interview with Sudbury.com. The embattled contractor says that it's time for people to hear his side of the story, and that the fallout from online complaints in a closed Facebook group along with the March 7 protest, have been detrimental to his business. "Did you hear the phone ring once while you're here? You ask any of my clients, my phone never stops," said Murray during an interview with Sudbury.com at his office on April 10. According to Murray, EcoLife does roughly $1 million worth of contract work in a year. On average, Murray says he would have close to $250,000 worth of contracts lined up by this point in the year, but between January and April of 2019, he's looking at closer to $40,000 in jobs. At the core of the complaints of those who have publicly complained about Murray's business practices is that customers say they have put down deposits, usually in the thousands of dollars, for work that has not been completed. A big selling point for Murray was the fact that he was part of the GreenOn program, which allowed him to install energy-efficient windows in people's homes and gave clients who chose these windows a rebate from the Ontario government. 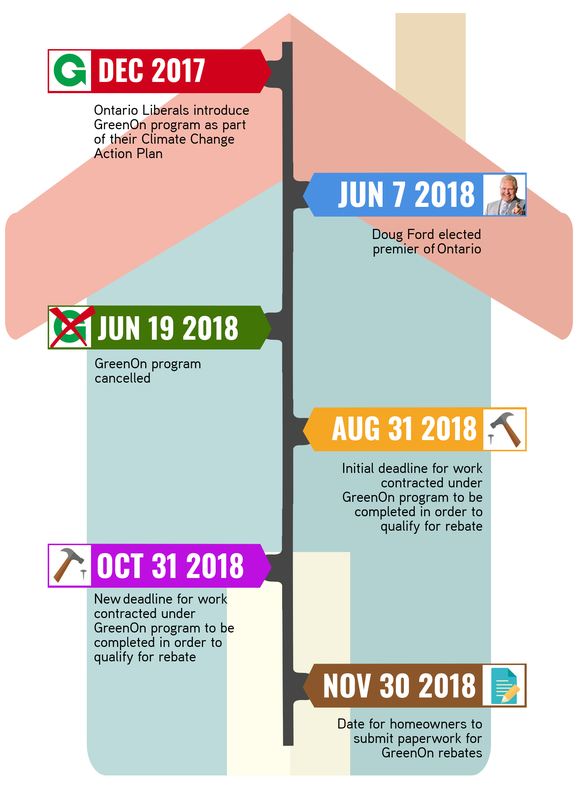 When the GreenOn program was cancelled by the Ford government, a time crunch was put on jobs that had been contracted and they would have to be completed by a deadline of Aug. 31, 2018 in order for clients to be eligible for their rebates. An uproar from contractors who had large backlogs of work under the GreenOn program pushed the Ford government to extend the deadline for work to be completed to the end of October. "I didn't get my applications (for the GreenOn program) completed until the end of February (2018), because the GreenOn people kept losing my applications; we kept sending it in and sending it in," said Murray, who also pointed to adverse weather conditions in 2017 for putting him behind the 8-ball. "I had clients from that year (2017), and we had a bad year of rain the whole summer, so we got behind on installations on roofing, on building garages, on additions. My downfall is that I'm a home improvement company; I'm not a window and door company. What happens is I take on projects that take a lot longer, that take a lot of manpower, and unfortunately there's a lot of variables that can change my timelines on installations being completed, weather being one of them." Murray did receive his GreenOn certification, and by June 2018, before the program's cancellation, he had more than 100 jobs lined up under the program. With the announcement of its cancellation, Murray said it became a race against the clock for many contractors to get the work done so that their clients would be able to receive the rebate that they had been promised. "You go from having manufacturers who are making 1,000 windows a week to now maybe 10,000 windows a week," said Murray. "Where do you get the manpower for that? The training on that to make windows, they had their own challenges. It went from four to eight weeks to get windows, to three to six months." Additionally, Murray says the fact that he's a smaller outfit put him at a disadvantage and was lower down the queue when it came time for him to get his windows that he had ordered, as larger, multi-million dollar building companies were given priority. "I had to show people that I'm not the only guy, when the cancellation came on June 19, it was like a fire sale," said Murray. "I had people calling me upset, afraid that they weren't going to get their grant money. Even when the extension happened to October, people still didn't believe that was true. But even October, everybody knew it wasn't going to happen. People were pulling their credit card payments on custom-ordered windows." Murray says that he is no longer taking credit card payments on jobs, and that he has close to $60,000 worth of windows sitting in his shop from jobs that clients cancelled. At best, he says that he could get 20 cents on the dollar for the windows if he tried to sell them. With more than 100 jobs to be completed in a short period of time, Murray admitted that there was a bit of a loss of control on his part and that a shift in the balance of power had occurred where his employees had become the ones dictating when and if jobs were going to get done. Murray said he paid for at least eight of his workers to be certified under the GreenOn program at nearly $700 each. While a select group of Murray's employees were certified to install windows under the GreenOn program, he says he has roughly 30 employees, and the challenge with the cancellation was to keep his guys working, which created an even larger backlog. "Let's say a job we sold in March we're expecting our windows in June, we don't have our product yet, what do you do with those installers? You put them on siding jobs and you can't leave those jobs," said Murray. "So you take on all these things and all of a sudden you have one guy falling sick, even recently one of my main guys got t-boned. Things happen, out of my control, when you lose installers that are key guys and you're paying them well so they don't leave and they still leave, what do you do?" When the announcement came of the GreenOn program's cancellation on June 19, Murray says that he was in a state of panic, and his employees picked up on that and took advantage. Murray asked for his guys to work weekends in order to complete as many jobs as possible, and most refused. "Everybody started taking holidays with their sick days, I called the Ministry of Labour and there's nothing I can do," said Murray. "Do I yell at them, do I fire them? I need them. Handcuffed again. We calculated it was about 16 weeks of work, do you know how many jobs I could've got done in 16 weeks? These aren't helpers taking it, these are lead guys that are taking holidays. I can even talk to my clients and they'll tell you, they know that." To this point, Murray says that a little more than half of the jobs he contracted under the GreenOn program have been completed and he is fully intent on completing the close to 40 remaining jobs for those clients who have not had their windows installed yet. Murray says that he called his clients to make dates for their work to be done, and that he's offering to do either do the work for free or give his clients cash himself. With his back up against the wall, Murray says that no one has been listening or helping, and he can stay silent no longer and wants to put a stop to the negativity surrounding his company. "I'm a reputable contractor. I've been in business now for 10 years. Why all of a sudden do the wheels come off for me, why am I here?" said Murray. "This is what the story is, for the last 10 years, other than people badmouthing me on Pissedconsumer, because that's all bullsh*t and I'm speaking with them right now because I'm going to get a court order to get it taken care of. "People say just let it go, I've talked to so many business people in this town who say it's going to blow over and to let it go, but they're not stopping, that's why Canadian Contractor came out, they're guiding them. There's no story here, the story is GreenOn that put contractors up against the wall and never wanted to understand, they've never been on a job site and (know) what it takes. The biggest joke was when they cancelled the first deadline in August, you couldn't get windows that fast, that would've destroyed everybody." While EcoLife has contracted roughly $40,000 worth of jobs between January and April of this year, Murray says the first priority is to finish jobs that were contracted last year that have not yet been completed. "It's all GreenOn that caused this. People are taking this out of context, they don't want to understand they don't want to listen. I've done great work. Why am I all of a sudden a bad guy? You ask people. The complaints aren't about the work or my prices. It's about the length of time for the jobs, and taking deposits," said Murray. "Why do lawyers take retainers? Why do you have to pay a deposit when you redo your kitchen? I'm not the only person who takes deposits. I can only control the controllables."